YORK HAVEN, Pa.: Lance Dewease had an anxious moment during the Kevin Gobrecht Classic Thursday night at BAPS Motor Speedway. The Fayetteville driver stormed from eighth to the lead and was starting to pull away from the field. Then, disaster almost struck as he passed under the flagstand to complete the 17th circuit. Out of nowhere, Dewease smacked the outside wall on the frontstretch. He bent the W-Link, which could have cost him another victory. Not even the wall could stop Dewease’s march. 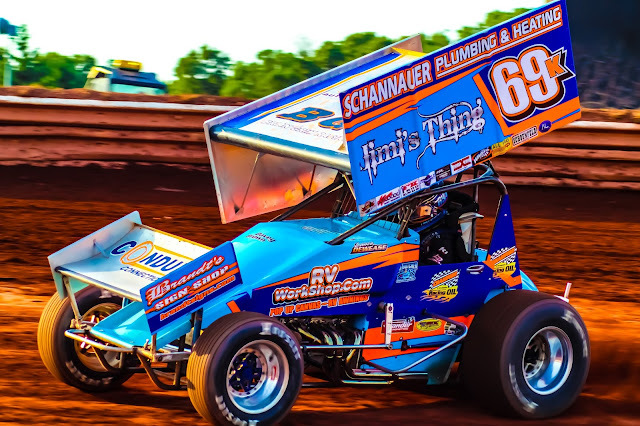 He held off Greg Hodnett over the final 13 laps to earn the win in the Kevin Gobrecht Classic. Dewease’s 20th win at the speedway was worth $4,900. “I really didn’t see anyone in front of me, and I didn’t know who was leading,” Dewease said. “I came off Turn 4 and glanced over at the scoring tower and hit the wall. Afterward, it wasn’t so much about the money for Dewease. It was nice … but the most important thing was standing in Victory Lane with the Gobrecht family to honor the late Kevin Gobrecht. “Kevin lost his life way too soon,” Dewease said. “The fortunate thing is that he lost it doing what he loved to do. You have to respect that part of it. “His family has done so much for this sport. They could’ve been so mad, and they weren’t. They invested so much, even before Scott [Gobrecht] became a promotor at a speedway. The first lap was marred by a four-car melee on the fronstretch. Chad Trout got turned around, which led to Kyle Moody, Ryan Higgins and Cory Haas getting involved. Haas got the worst of it, tipping over. All drivers were OK.
Cale Conley jumped out front, with Parker Price-Miller and Ryan Smith ripping around Robbie Kendall for second and third. Price-Miller showed the nose to Conley in Turns 1 and 2 on Lap 4. Conley maintained the top spot and built a small .862-second lead by the fifth circuit. Meanwhile, a three-car battle for fourth was being waged between Trey Starks, Brock Zearfoss, and Dewease. Dewease worked high and low. It wasn’t until Lap 9 that he finally cleared Zearfoss in Turns 1 and 2. Before the lap could be scored, he surged past Starks and took over the fourth position. “Our car gets a little better as we run it,” Dewease said. “It’s normally not real great early, especially with a load of fuel. “Zearfoss was really good early, and he could run the bottom and the top. He was pulling wheel stands off the corner, but he just couldn’t get past [Starks]. I got runs on him, but I couldn’t do anything. Smith shot by Price Miller for second by the completion of Lap 11. He continued his path to the front, sliding Conley in Turn 2 on Lap 13. Dewease followed and took the runner-up position before the lap was scored. Dewease wasn’t done there. He got a good run off Turn 4 and made the pass on Smith for the lead on the low side of Turns 1 and 2 on Lap 14. But it was hard for Dewease to get away. Not only did he have to deal with heavy traffic, he smacked the outside wall on the fronstretch just as he completed Lap 17. While Dewease gathered his car, seventh-place starter Danny Dietrich entered the picture on Lap 18. He took third away from Price-Miller. Meanwhile, Dewease was struggling a bit at the front, as his lead was cut to 1.384 seconds. Hodnett was also on the move. He passed Price-Miller for fourth by Lap 20 and battled Dietrich for third. He completed the pass on Lap 22, blowing by Dietrich on the top side of Turn 2 and tip-toeing past Smith for second on Lap 25. But he couldn’t catch Dewease, who found a rhythm and took the win by 1.155 seconds. 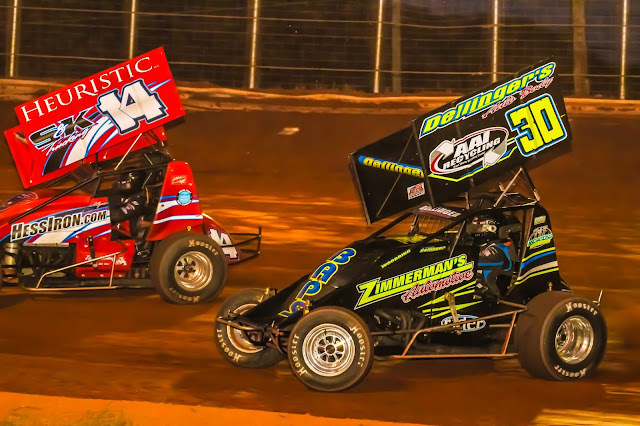 Hodnett held off Dietrich for second. Brock Zearfoss and Smith completed the top five. “I didn’t know it was hot until after the checker, because you really don’t have to look at the gauges the way this place is,” Dewease said. “I knew something was wrong, because it changed its tone … You can tell that. Ryan Smith set quick time for the 27-car field with a lap of 14.862. Trey Starks, Robbie Kendall, and Conley were heat winners. Bradley Howard won the B-Main. Scott Dellinger won an entertaining 25-lap Super Sportsman feature. It was his fourth victory of the season at BAPS Motor Speedway. The defending speedway champion started 11th on the grid and passed three cars by the completion of Lap 1. He took sixth by Lap 3 and held his position for the next five circuits before cracking the top five. The big move for Dellinger came on Lap 12. He slipped past Frankie Herr for fourth and Chase Gutshall Jr. for third by the flagstand. Nate Young led the first 17 laps and was setting a blistering pace. But Dellinger was too much for this field, catching and passing Young on the 18th circuit. Once out front, Dellinger was in a race of his own. He took the win 3.018 seconds at the finish. Frankie Herr came up to second, with Kenny Edkin, Young, and Timmie Barrick completing the top five. “Nate was having a good run and was holding a good line coming off,” Dellinger said. “Turn 4 down here, I wasn’t sure I was going to be able to get beside him. We were pretty hooked in Turns 1 and 2, but three and four was my better corner. I could roll around there without getting out of the gas. Dellinger, Young, and Bruce Buckwalter Jr. were heat winners for the 24-car field. 410 Sprint Car Feature Finish, 30 Laps: 1. Lance Dewease; 2. Greg Hodnett; 3. Danny Dietrich; 4. Brock Zearfoss; 5. Ryan Smith; 6. Parker Price-Miller; 7. Cale Conley; 8. Freddie Rahmer; 9. Lucas Wolfe; 10. Brian Montieth; 11. Trey Starks; 12. Robbie Kendall; 13. Tyler Ross; 14. Kyle Reinhardt; 15. Anthony Macri; 16. Adam Wilt; 17. Brett Michalski; 18. Bradley Howard; 19. Ryan Higgins; 20. Jordan Givler; 21. Glenndon Forsythe; 22. Chad Trout; 23. Kyle Moody; 24. Cory Haas. Super Sportsman Feature Finish, 25 Laps: 1. Scott Dellinger; 2. Frankie Herr; 3. Kenny Edkin; 4. Nate Young; 5. Timmie Barrick; 6. Chase Gutshall; 7. Bruce Buckwalter Jr.; 8. Doug Dodson; 9. Mike Enders; 10. Russ Mitten; 11. Davey Walsh; 12. Jay Fannasy; 13. Chuck Landis; 14. Tom Wychoff; 15. Jake Miller; 16. Matt Ondeck; 17. John Edkin; 18. Lanny Hake; 19. Chad Criswell; 20. Justin Foster; 21. Mike Potts; 22. Daniel John; 23. Todd Leonard; 24. Chris Meleason.